Following on from his recent adventures in London at the Houses of Parliament, Rocco Buttliere is back on the other side of the ‘pond’. 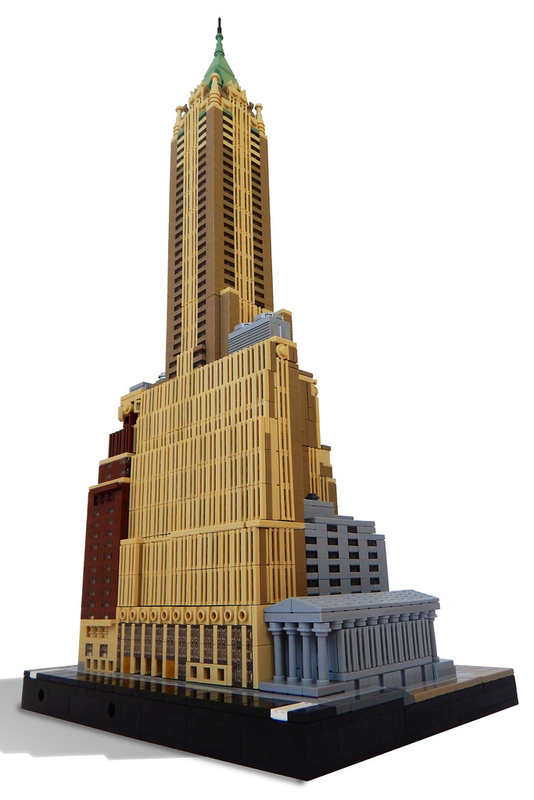 Rocco’s latest build in his 1:650 Architecture series is 40 Wall Street in Lower Manhattan. Rocco tells us that 40 Wall St is a 927ft, 70 storey skyscraper, completed in 1930. It held the title of World’s Tallest building for less than a month before the Chrysler Building took the title (albeit after a bit of arguing). The building was designed by lead architect H. Craig Severance in collaboration with associate architect, Yasuo Matsui. Apparently this creation had been on hold until LEGO Architecture Venice 21026 was released as it provided the sand green quadruple convex slope which tops the gabled roof. Did you spot the screwdriver at the top? Looks like the real thing, I wanted to post a photo of the real 40 Wall Street here too bad we can’t! Yeah but I bet most people will google to see an image for comparison if they are not familiar. Rocco’s builds are very accurate architecturally…but he is a student of architecture so attention to detail is key.